The Audi Q7 e-tron quattro is the world’s first plug-in hybrid car with a six-cylinder diesel engine and permanent all-wheel drive. Its sporty power is impressive: The 3.0 TDI and electric motor deliver 275 kW (373 hp) and 700 Nm (516.3 lb-ft) of system torque – enough to accelerate from 0 to 100 km/h (62.1 mph) in 6.0 seconds and for a top speed of 225 km/h (139.8 mph). The Q7 e-tron quattro travels up to 56 kilometers (34.8 mi) on electric power alone. 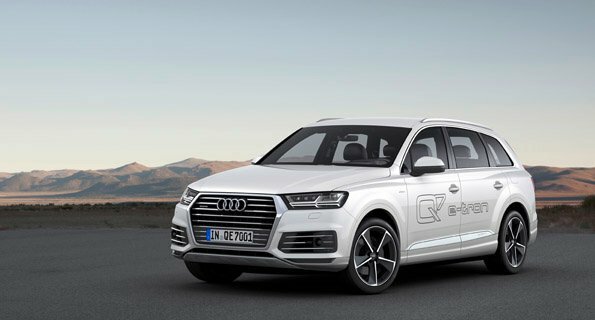 According to the ECE standard for plug-in hybrid vehicles, the Audi Q7 e-tron quattro needs only 1.7 liters of diesel fuel per 100 kilometers (138.4 US mpg) – with a CO2 emission level of 46 grams per kilometer (80.5 g/mi) and a new best value in the segment. The standard thermal management system with integrated heat pump was specially developed for the Q7 e‑tron quattro. With this technology, Audi is the first manufacturer worldwide to set a new benchmark in the areas of interior comfort and climate control efficiency. The hybrid management system controls the operating states of the Audi Q7 e-tron quattro intelligently, flexibly and with high efficiency. The driver can choose between four modes. The EV mode prioritizes electric driving, while in hybrid mode hybrid management decides on the type of drive for the most part freely. In battery hold mode, the system stores the available electrical energy, and charges the battery in battery charge mode. The body plays a decisive role in the relatively low weight of the Audi Q7 e-tron quattro. With its many components made of hot-formed steel and aluminum, it utilizes the same lightweight construction potential as the conventional Q7. The drag coefficient is only 0.34. The Audi Q7 e-tron quattro has the most spacious interior in its segment. The three rear seats have adjustable backrests and can be moved fore/aft as desired. The lithium-ion battery is accommodated in a space-saving way: The luggage compartment has a capacity of 890 liters (31.4 cu ft) in its basic configuration, with a maximum of 2,075 liters (73.3 cu ft). An electrically operated tailgate is standard.